This is pretty cool. 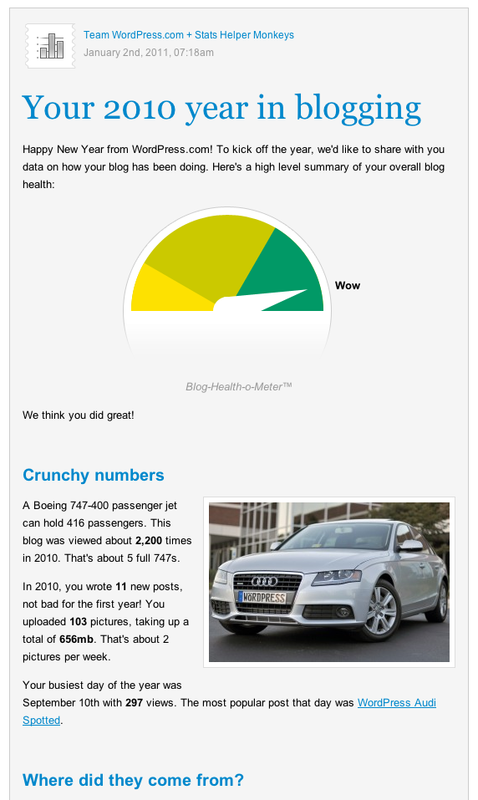 WordPress.com sent out stats for blogs from 2010. It’s nice to have a glance at my info for michaeltorbert.wordpress.com. Wow, only 11 blog posts. I need to get with it this year. In 2010, there were 11 new posts, not bad for the first year! There were 103 pictures uploaded, taking up a total of 656mb. That’s about 2 pictures per week. The busiest day of the year was September 10th with 297 views. 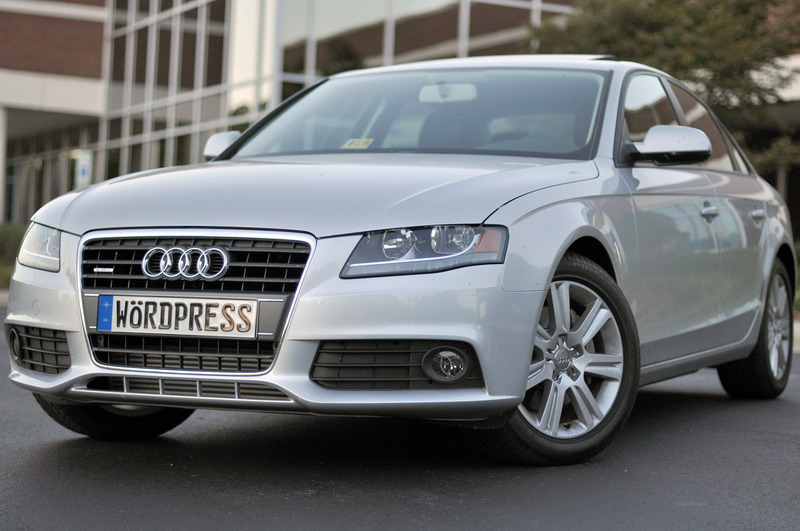 The most popular post that day was WordPress Audi Spotted. The top referring sites in 2010 were twitter.com, michaeltorbert.com, WordPress Dashboard, facebook.com, and healthfitnesstherapy.com. Some visitors came searching, mostly for michael torbert, wordpress car, wordpress license, wordpress shirts, and michael torbert wordpress. I am an absolute beginner with WordPress and web page development. My wife and I operate a small pop-up rental business, one camper in the summer months. We could not afford to have anyone develop a page for us. Some very helpful people got me started with WordPress. After the site was up Google had a nightmare and my site did not show within the first 100 pages of a keyword search. I struggled to learn SEO and correct the hundreds of mistakes when I accidentally stumble upon the plug-ins. Remember I am very new. I installed Your All in One SEO and followed the input on a web page about the settings and now I am listed either from #1 to #3 with all of my keywords on Google. I am certain you would rather have cash than praise and promise as soon as I get some together from this business it will be forthcoming. However, I could not wait to send the praise. Thanks so much for giving me something that works and I could understand. I am enjoying reading all of the post on your site. I have been online a long time, building, marketing and consulting. However I have never had a site built with my name on it. I recently spoke with my best friend and he said I needed to brand myself, and start getting ready to put out my on digital products. So I am looking around trying to figure out how and what to put on such a site. Up until now I haven’t really seen anything or format that I liked, but I do really like your format. Anyway just wanted you to know that. I also like the fact that you are a Christian and a Patriot! We need more of you in this great country my friend.